Carrie - the Stephen King novel, 1976 film (and its remakes) and this musical – is mostly remembered as a horror film, but it’s equally a coming of age film, its narrative exploring the changes of puberty, the pressures of high school and the impact of bullying. It takes typical high school tropes (predominantly the climactic prom) and turns them into something horrific and unique. And so, it was the composer of Fame (Michael Gore), alongside book writer Lawrence D. Cohen and lyricist Dean Pitchford, who decided to turn this story into a youthful musical. It flopped back in the 80s, but this new version at the Southwark Playhouse sees the musical making its return to the UK after it first premiered at the RSC in 1988. Fear not: this production is far removed from the camp and legwarmers of Fame, but the core material alone proves the writers have a keen sense for capturing the spirit of youth. What’s most apparent in this modernised update is that the central narrative and its themes remain utterly relevant. As a character, the shy, troubled Carrie represents a figure we can all relate to in some way, whether familiar with previous versions or if this adaptation is a first introduction. Musically, there are clear influences from Fame, even if only for the solid pop score and its excellent tunes. At times it succumbs to cliché, particularly with the introduction of songs and some glittering, synthy orchestration, but there are also some quieter, sacred moments. This is a score that jumps from the likes of the dramatic And Eve Was Weak and the sombre Evening Prayers, to the pop sound of The World According To Chris and the up-tempo fun of A Night We’ll Never Forget. Cohesiveness comes from the weaving together of musical themes and various reprises, making for a score that’s fun and surprisingly satisfying. Issues with the show in the past have stemmed more from the production rather than the central material. Here, Tim McQuillen-Wright’s design is minimal yet gritty and realistic, with room for some fantastical effects, whilst director Gary Lloyd's choreography is sparingly implemented. This is a believable presentation of a supernatural story, made touching by some excellent performances. The female ensemble give Regina George’s Plastics a run for their money, Jodie Jacobs is a formidable vocal force as gym teacher Miss. Gardner, and Greg Miller-Burns has a warm tone as Tommy Ross. As Margaret White, Kim Criswell’s vocals are phenomenal with some tough material testing even the best soprano. 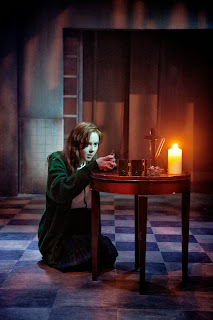 The performance of the night, though, is Evelyn Hoskins as Carrie. The difficulty of the role is delivering wide-eyed vulnerability and fear alongside a strong vocal to match the soaring pop melodies (the title song especially) – after this production it’s difficult to imagine anyone else as Carrie. There remain flaws to this production though. Perhaps it’s the thrust staging, or the acoustics of the space, but the sound production and use of microphones is off. It’s as if the singing is detached from the stage and the singers are performing underwater – as such it’s difficult to ascertain many of the lyrics. Additionally, it’s a difficult space to direct in, with many small moments missed depending on where the audience are sat. It’s where the show diverges from the film that it most misfires. For instance, the roles of Tommy and Sue have been increased which removes any ambiguity of whether they’re trying to help or humiliate Carrie – indeed, the whole narrative is framed by Sue’s obvious guilt. 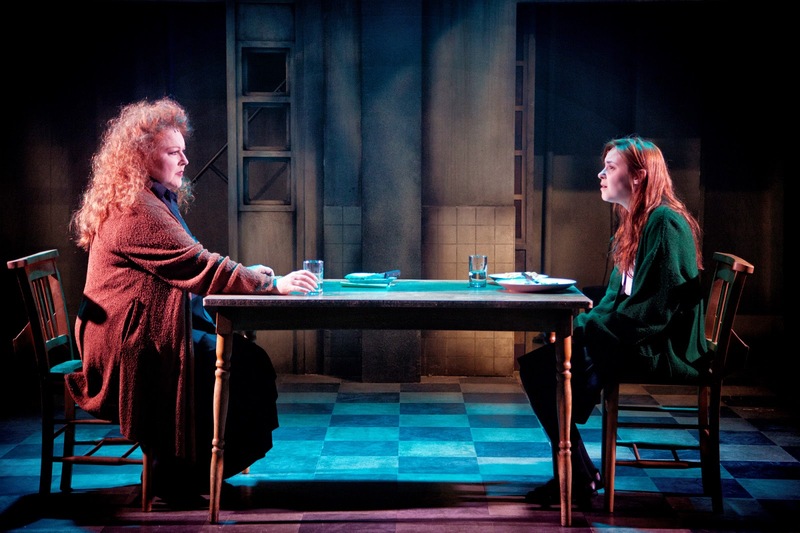 More so, the success of the show hinges on the interpretation of Margaret. Here she feels less like a psychotic, religious fanatic and more like a humble mother. Giving her a ballad in the second half means we sympathise with her – as such the fatal events of the final scene feel sudden, unwarranted and anticlimactic. The role of Margaret is just one example of the musical slightly diminishing the horror elements in favour of a more relatable coming of age narrative that aims for truth and believability. Even so, this is a highly polished production that has clearly improved on the original flop extensively, turning it into a haunting teenage drama that deserves another chance. Watch: Carrie runs at the Southwark Playhouse until 30th May.